Regular readers of my blog have probably noticed that I often write with a weekly theme. I find it a good way to organize my thoughts and share a variety of posts on the same subject. Sometimes I'm more explicit about it that other weeks--I may announce the theme at the beginning of the week updated throughout the week as new stories are posted. 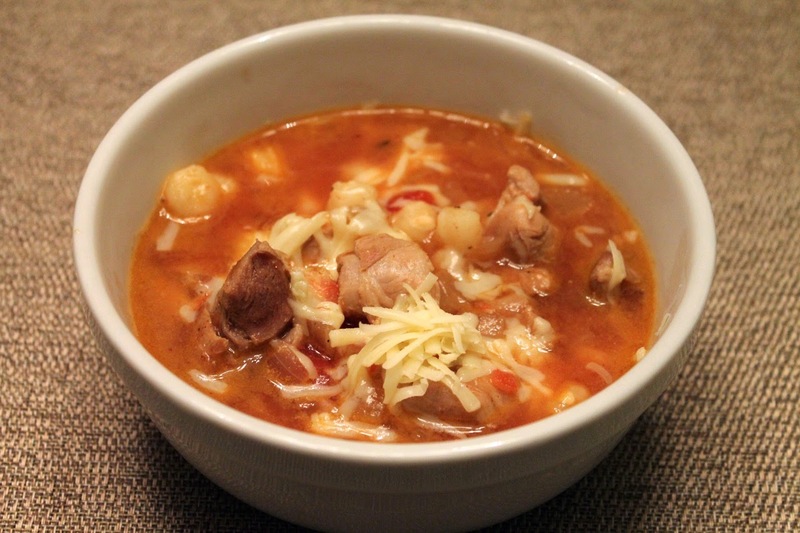 Other weeks the theme is "looser," like a collection of recipes that may share a key ingredient or cuisine. The themes I put the most effort into are the ones I'm most proud of. They may involve greater than usual research or experimentation. Below are the themes I consider highlights from this last year (click on the title to go to the week's main post or any of the other links for specific stories). A new generation of cooks are rediscovering pressure cookers as a versatile tool for achieving slow-cooked techniques in a fraction of the time. And a new generation of devices have addressed the safety concerns that made pressure cookers the stuff of our childhood nightmares. 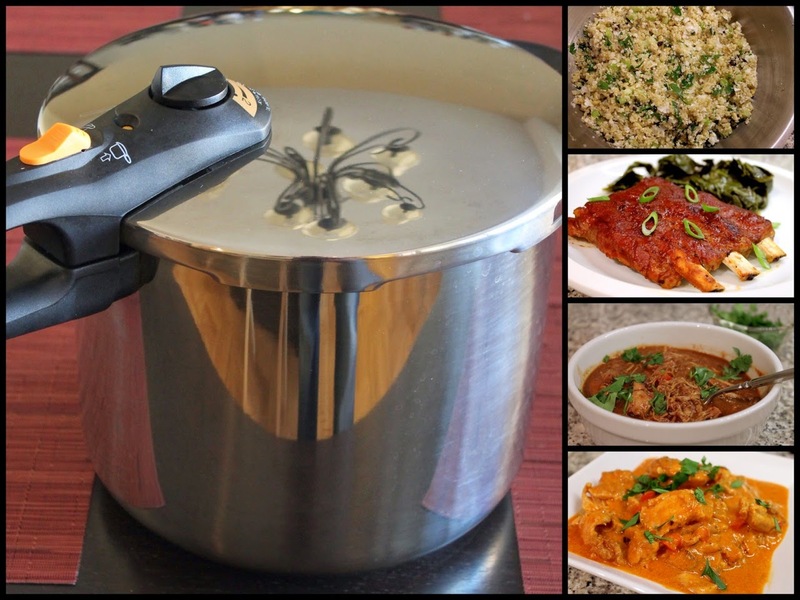 I discussed features of modern pressure cookers, particularly my model, a Fagor Duo 8-quart pressure cooker; shared recipes for Mole Chicken Chili, Chicken Paprikash, Quinoa Salad with Cauliflower and Barbecue Spareribs, a recipe that has proven to be one of my most popular; and in the introductory post, I shared additional pressure-cooker resources. For the second year, I invented cocktails representing all of the Oscar nominees for Best Picture (plus a bonus cocktail for a film that wasn't nominated but resulted in this year's Best Actress award, Cate Blanchett in Blue Jasmine). Highlights included American Hustle, a "forgery" of a Pimm's Cup; Captain Phillips, an African-inpsired play on the Screwdriver; and The Wolf of Wall Street, a riff on the vodka martini that was the most popular of this year's Oscar drinks. Included with the week were a couple of Oscar party (1 and 2) snacks as well. Favorite salad dressing? It's a toss up. Salads get lots of attention, salad dressings not so much. For my spring salad week, I put the focus on the vinaigrettes and creamy mixtures responsible for pulling together and complementing the various leafy, meaty, fruity and crunchy ingredients we toss into salads. 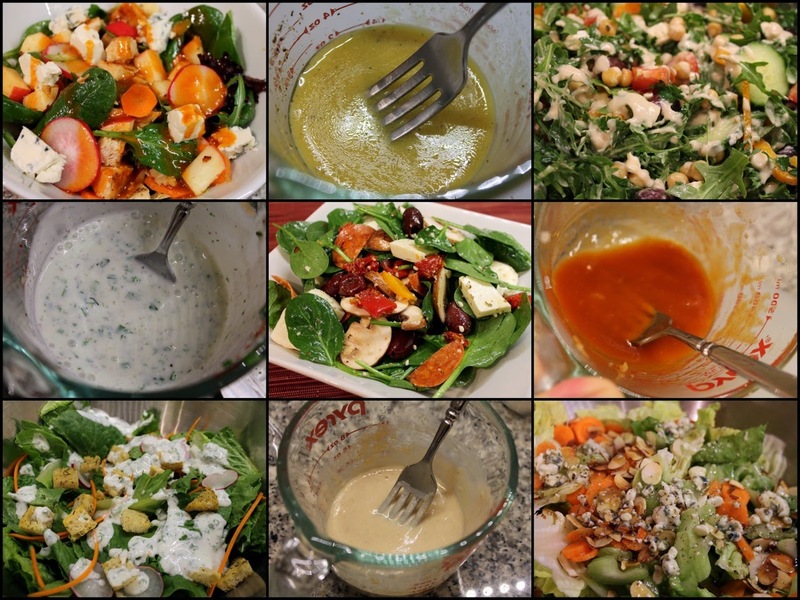 In my introductory post, I offered tips for dressing salads, and during the week shared recipes for a lighter take on ranch dressing made with Greek yogurt, old-school French dressing, lemon-tahini dressing, a childhood favorite - blue cheese apple cider vinaigrette and that simple workhorse, basic vinaigrette, which I used to dress a pizza salad. 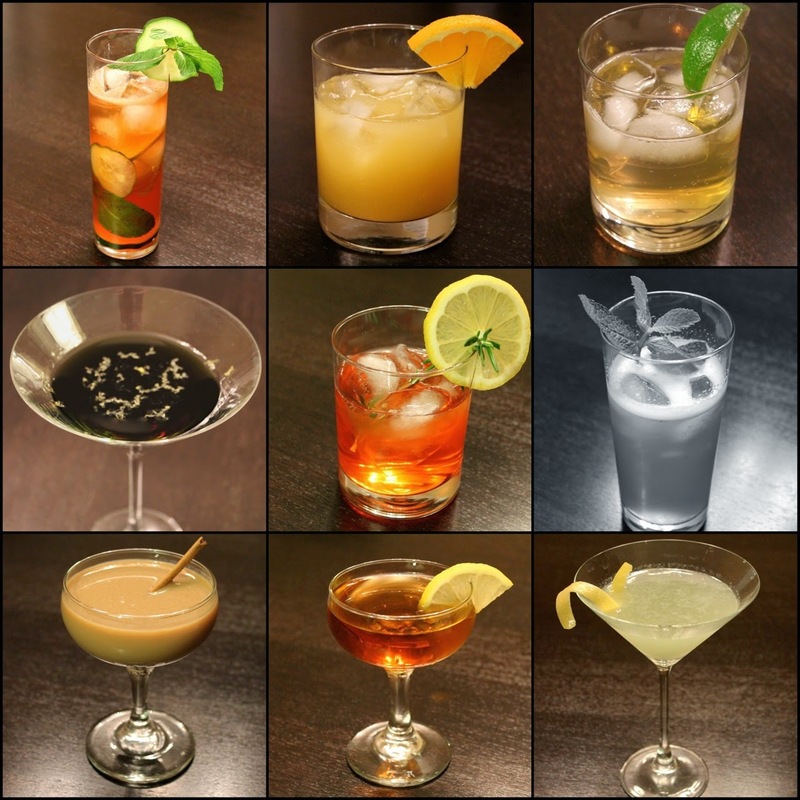 Readers who like my cocktail coverage should definitely check out Cocktail Bitters Week if you missed it. This was one of my most substantial efforts this year, representing a significant amount of research into cocktail history and experimentation with various contemporary cocktail bitters to present a week of content that that explored bitters role in cocktail history as well as the modern craft cocktail renaissance. 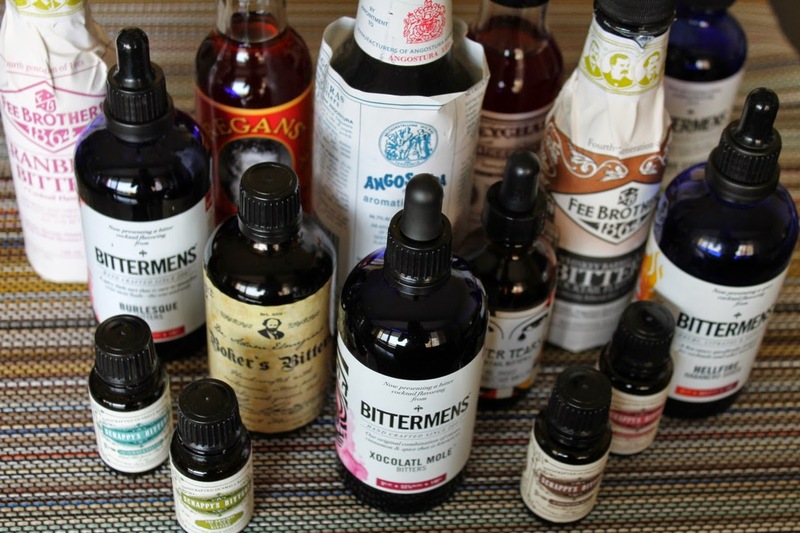 For the research, I leaned heavily on two great works: Brad Thomas Parsons' Bitters and David Wondrich's Imbibe!, both of which are discussed in my introductory post. Posts covered classic cocktails with classic bitters like the Manhattan with Angostura bitters and the Sazerac with Peychaud's bitters and classic cocktails with a modern twist like the Old Fashioned with Fee Brothers' Whiskey Barrel-Aged Bitters, the Fancy Gin Cocktail with Boker's Bitters (a modern rendering of an old fashioned recipe) and the Improved Tequila Cocktail with Bittermens' mole bitters. I explored quite a few modern bitters creations like a G&T Martini using Scrappy's lime bitters and a Smoky Paloma made with Bitter Tears' bacon-peppercorn bitters. I love the smoky taste of grilled food, but as an urban apartment dweller, I unfortunately cannot enjoy true grilled taste at home. 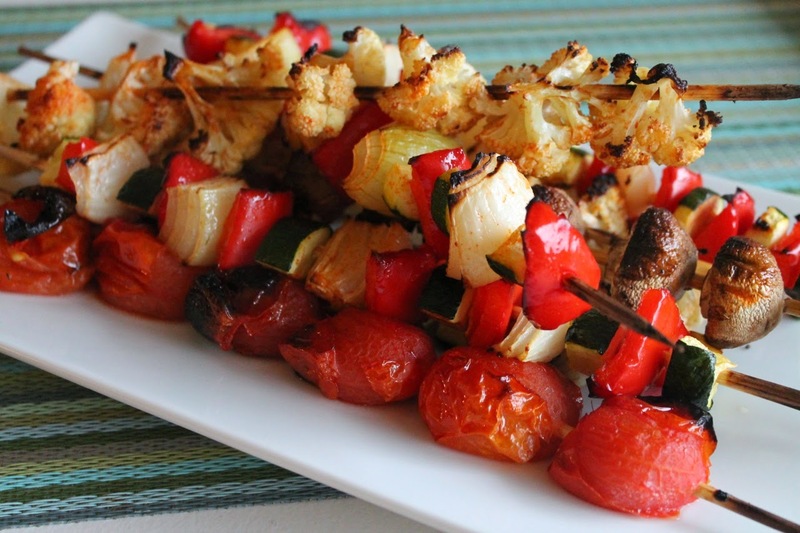 This smoky recipes week kicked off summer with the true grilled flavor of simple grilled salmon but also ways to use smoky flavors in recipes prepared indoors, like smoked cheese and paprika in a smoky tuna (noodle) casserole and broiled vegetable skewers. 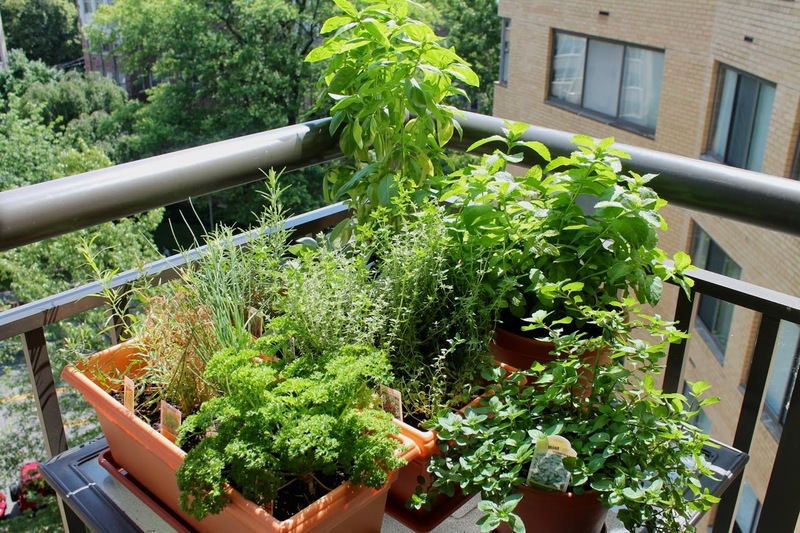 This wasn't a true theme week, but a recurring theme throughout the late spring and summer as I tried my hand at growing an herb garden this year. Turns out I have a green thumb after all, as I cared for an enjoyed fresh basil, mint, thyme, rosemary, sage, tarragon and chervil. I provided updates on the garden at 6 weeks (including how I started the garden) and 12 weeks and shared recipes for dishes such as linguine with fresh herbs, first hints of summer salad, pasta with peas, bacon and parsley, bacon barley kale corn mushroom soup and chicken breasts with tarragon-lemon-garlic sauce. I think tomatoes are just peachy. Tomato week actually stretched into 2 weeks this year, which I don't apologize for, given that tomatoes are my favorite vegetable and are only in-season for a few months. I started and the weeks with Middle Eastern salads: Fattoush, tomato and pita salad, and Tabbouleh made with freekeh, a smoky wheat grain. 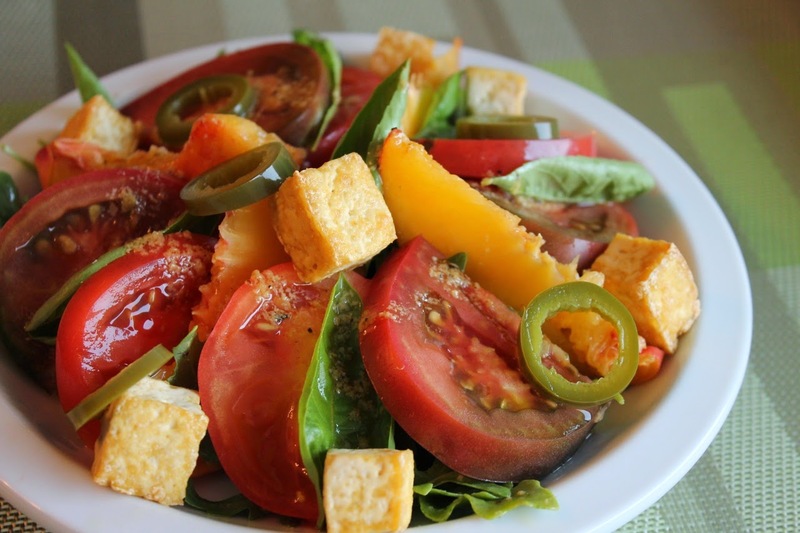 Other recipes include penne with roasted sungold tomatoes, peach and tomato salad with tofu and a Greek salad refashioned as a soup. I also created a special mashup sandwich: the PBLT&J. The highlight of my tomato recipes this year though was the Tipsy Gazpacho Cocktail, a drink I created inspired by the classic cold Spanish soup that was selected as a finalist in the Washington Post Top Tomato recipe contest. My computer has an unusual affinity for this photo. 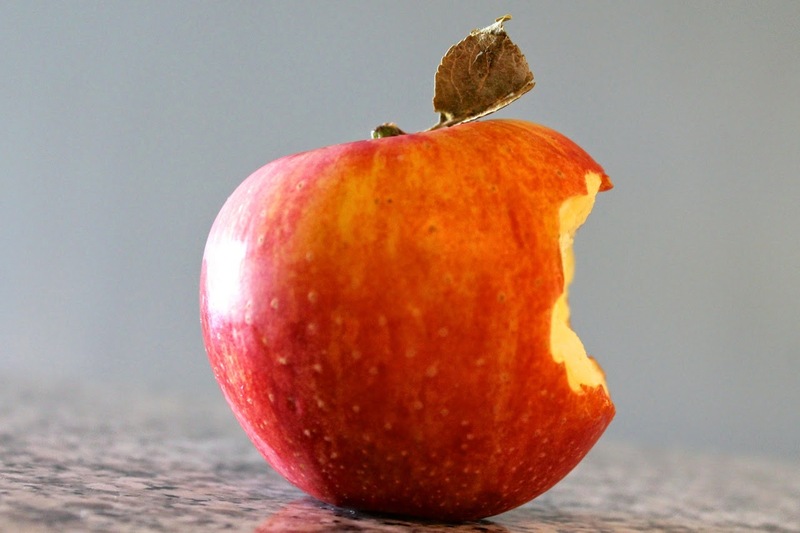 Apples are a wonderfully versatile fruit that sometimes don't get enough credit. They make a great snack raw and taste great in salads, soups, desserts, cocktails and other dishes. For this theme week, I explored this versatility with an apple tasting and recipes for a smoky apple crostini, an apple-potato soup with apple chicken sausage, roasted stuffed caramel apples and two great apple cocktails (1 and 2). 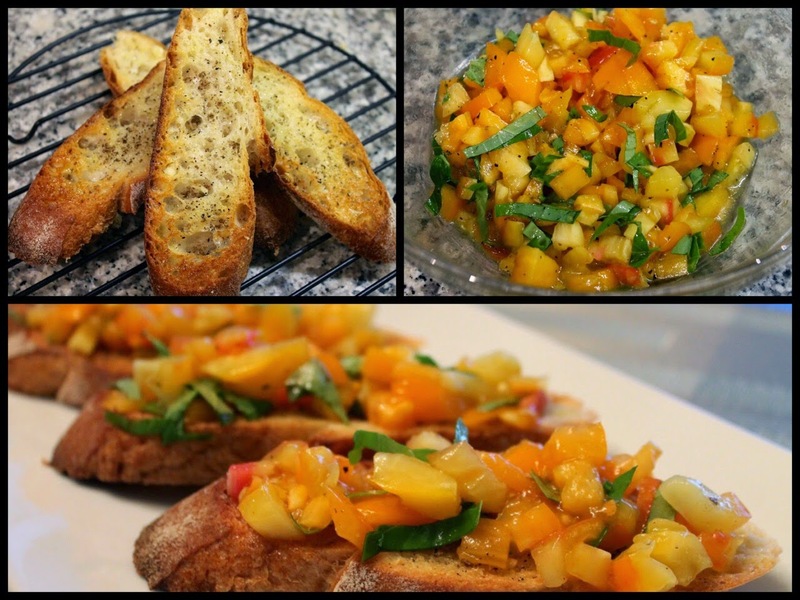 Depending on who you ask, one or all of these things can refer to "bruschetta." Language is a fascinating subject and food, given its ubiquitous and international status, has its own unique connection to language. Like the cocktail bitters week, this was another theme that required significant research, both academic and original. I tied the theme to the release of The Language of Food by Dan Jurafsky, which discussed and used as a source along with other research to discuss how fajitas, bruschetta and the martini are all food terms whose meanings have evolved in recent years. Chris and I love Tex-Mex and other Southwestern cuisines and spent a fair amount of time eating it this year on trips to Texas, Arizona, Utah and New Mexico. We wrote about great restaurants in Dallas and Santa Fe (and generally not so great ones around national parks). We had particular affinity for the barbecue at Lockhart Smokehouse in Plano, Texas. Our experiences inspired my cooking in a number of ways, including a Southwestern fall grain bowl, smoked sage margarita, a mole-brined roast turkey with mole gravy for Thanksgiving and a spicy turkey posole with Thanksgiving leftovers.